MEN’S VITALITY is a powerful blend of vital nutrients, vitamins, and minerals combined to bring focused support to the areas where men need it most. Taken daily, this formula promotes vitality, stamina, immune support, and overall health throughout all stages of a man’s life. • Maintains long-term wellness, vitality, and stamina. • Provides balanced nutritional support for daily immune strengthening. • Promote gentle liver flushing and detoxification. • Targeted herb blends for metabolic and endocrine support. • Offers support for the prostate and reproductive health. • Reduces the effects of stress. • Strengthens concentration and cognitive functions. • Doctor formulated. Meticulously sourced. Third-party tested. • Vegan. Gluten Free. Non-GMO. Acts of self-care and daily wellness may not be the first thing men think of when it comes to ensuring lasting health and virility; but establishing a regular, preventative practice aimed at cell health and immune support is especially important for men, many of whom leave symptoms untreated or undiagnosed longer than women. Men are susceptible to atherosclerosis (the hardening of the arteries that causes heart disease), compromised liver function, lung cancer or poor respiratory health, prostate cancer, depression, and diabetes. Common issues like erectile dysfunction may well be an indicator that something else is out of balance in the body, so it’s important for men to monitor and attend to sexual health throughout their life. 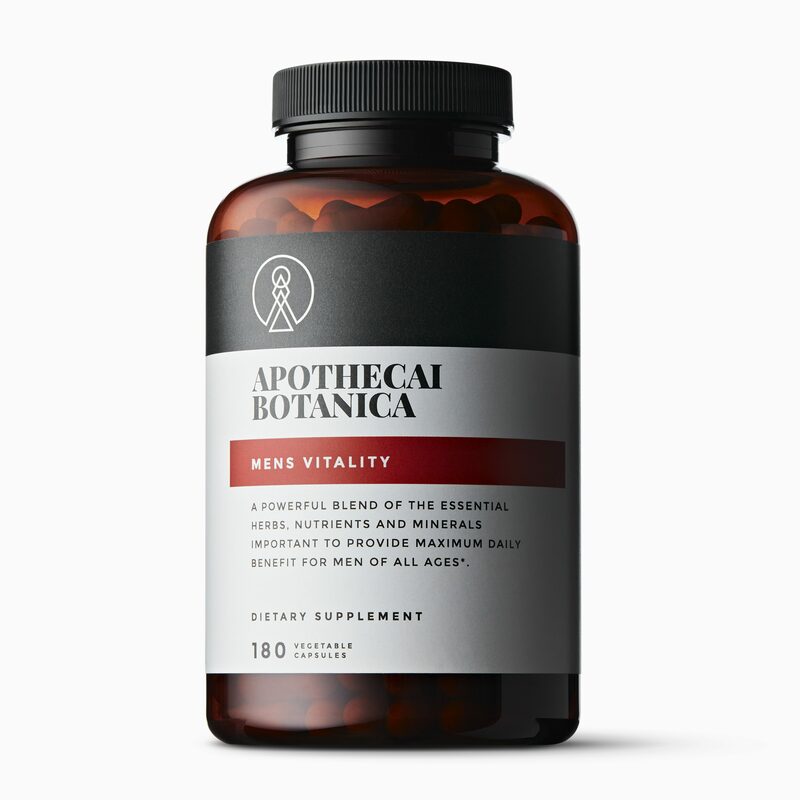 MEN’S VITALITY offers essential support for men of all ages. Rich in powerful, bioactive ingredients, this blend of 46 essential vitamins, minerals, herbs and antioxidants includes four unique blends of nutrients and herbal allies designed to support the key areas of men’s health. Our products are 100% vegetarian, allergen and gluten free, and contain no artificial flavors, preservatives or colors. Apothecai Botanica supplements are manufactured in a manner that meets or exceeds the current Good Manufacturing Practices (GMP) guidelines, as outlined by the Food and Drug Administration (FDA). Suggested Use: As a dietary supplement, take 3 capsules with food, once in the morning and once in the evening, or as directed by your healthcare practitioner. Contains soy. Not recommended for those allergic to soy. Vitamin A (as betatene, palmitate) 2500 IU; Vitamin C (as ascorbic acid, calcium ascorbate, magnesium ascorbate) 500 mg; Vitamin D3 (as cholecalciferol) 500 IU; Vitamin E (as D-alpha-tocopheryl acid succinate) 20 IU; Thiamine 2.5 mg; Riboflavin (as riboflavin-5-phosphate) 5 mg; Niacin (as niacin, niacinamide) 25 mg; Vitamin B6 (as pyridoxine hydrochloride, pyridoxal-5-phosphate) 11 mg; Folate (as 5′-methyletrahydrofolic acid) 200 mcg; Vitamin B12 (as methylcobalamin) 30 mcg; Biotin 150 mcg; Pantothenic Acid (as di-calcium pantothenate) 15 mg; Calcium (as ascorbate, citrate, di-calcium pantothenate) 24 mg; Iodine (as kelp powder) 125 mcg; Magnesium (as citrate, ascorbate) 60 mg; Zinc (as citrate, picolinate) 7.5 mg; Selenium (as selenomethionine) 50 mcg; Copper (as sulfate) 1 mg; Chromium (as nicotinate) 60 mcg; Molybdenum (as sodium molybdate) 37.5 mcg; Potassium (as aspartate, citrate monohydrate) 15 mcg. Clean Detox Blend 102.5 mg [Glycine, Taurine, Broccoli Sprouts (Brassica oleracea), Milk Thistle Extract (Silybum marianum), Tumeric Root Extract (Curcuma longa), Oregon Grape Root (Mahonia aquifolium), Grape Seed Extract (Vitis vinifera), L-Glutathione]; Alpha Lipoic Acid 37.5 mg.
Prostate and Virility Blend 26.25 mg [Saw Palmetto Extract (Serenoa repens), Oat Straw Extract (Avena sativa), Damiana Leaf (Tumera diffusa), Pumpkin Seed (Cucurbita pepo), Pygeum Bark (Prunus africana), Stinging Nettle Leaf (Urtica dioica), Lycopene].